How did Mage Girl become a trilogy? And where is Mage Girl now? It began as a collaboration between Catherine (illustrations) and myself (text). As the number of words was restricted, we could not show the full text of the first chapter along with the illustrations. That made us decide to publish the full chapter on a separate page for those who had become curious after reading our chosen passages. Moreover, the story did not stop at Chapter One. Three and a half years after the writing began in May 2004, the final chapter was finished and the story had a subtitle - Dragonflame. Amy, Ari3n, Aleksandar, Bonnie, Carol, Crooty and Guenevere joined Catherine in illustrating the story. (And I tried my hand too with a seagull, a bird's eye's view of Ambat, a meeting and a few messages.) My thanks go to Dave Evershed in his capacity of barge expert for correcting Chapter Six, to Dragonlady for her competent advice on dragons, and to Avara for help with military expressions. True thanks also to Shawna who has told me more than I ever wanted to know about unpublished writers venturing into the publishing world (including some very valuable advice) and who was my first more-than-honest critic. Very special thanks go to Carol for ongoing assistance with tricky vocabulary, but above all to "my" illustrator Catherine whose imagination gave birth to at least one picture that strongly influenced the story. Last not least, Tanja and again Catherine stand as proud trustmothers to Khapuran and Brandiras respectively. After finishing Dragonflame, I started working on the sequel, Girl Mages. I finished this story in about half a year, but I promise it is no less exciting than Dragonflame. You will meet a number of familiar characters from Dragonflame besides Naya, but also many new ones. The premise is Ytobiq, the Land of Naya's birth, where Magic is still a privilege of the men, and girls born with Magic skills are imprisoned. When I approached the final confrontation of this story, I had the most strange experience: Out of the blue, I knew how the story was going to end, and much more disconcertingly, I knew there would be a third, and final, part to what I now have to call The Mage Girl Trilogy. I did not want any of this, and least of all the oft-copied trilogy idea, but as other writers can surely tell you if you have not experienced it yourself, characters have a tendency to take on a life of their own, and here it was very clear that Naya and Evulon told me they wanted to continue their adventures in a third story. As if writing Dark Magic, revising Girl Mages and working towards the publishing of Dragonflame were not enough to keep me busy, I have come up with the idea of a spin-off. Lanna and the Dragon, set two years after the end of Girl Mages and thus in parallel to Dark Magic, stars Lanna, the very young gifted girl Mage Naya rescues from a Mage prison in Takond. I promise I will write this story once Dark Magic is settled. The easy answer is, in the process of submission. But why did I take it offline? Fast forward to late 2012: Dragonflame is in the submission circuit, Girl Mages is under heavy revision, Dark Magic is on hold in chapter 10, and Lanna and the Dragon still only exists in my head. But I have made much progress in learning about the famous "getting published", have become a member of the Society of Children's Books Writers and Illustrators, for which I should really thank Dean, and have been advised by a published children's books writer (thank you Louise) to take my original material offline. 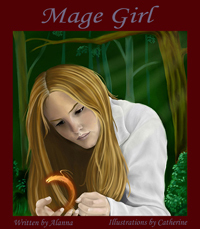 So if you have come looking here for Mage Girl, please do visit my official website.